Vice President Leni Loud Robredo makes headlines yet again. After she was said to have cried a glass full of tears for being downplayed at the #ASEAN2017 she has now cried foul to why the policemen got Max's Fried Chicken instead of Lugaw Ni Leni. VP Leni Loud decided to accuse President Rodrigo R. Duterte of overspending. 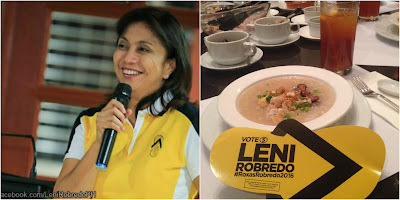 "Look, if the PNP had Lugaw Ni Leni we would have had better and cheaper meals. Letting them eat Max's Fried Chicken was too expensive. It's an outrage that not only was I downplayed but I also wasn't allowed to serve my lugaw." said VP Leni Loud in an interview on Crappler, Philippine Daily Non-Inquirer and ABiaS-CBN. She was also interviewed by Raissa Robles and Pia Ranada-Robles on separate occasions. This caused another outrage of Pinoy Netizens vs. VP Leni Loud. She went on an extreme blocking. More and more Netizens shows angry face icons on social media. There has been a flood of millions of hate comments in just one day. Some have even demanded her to return the campaign money where she served Lugaw Ni Leni to win her votes. Lately, Bongbong Marcos even posted a picture of himself eating Max's Fried Chicken to protest against VP Leni Loud.